Spice up your Kindle with a purple Kindle cover or Kindle skin.That dull gray Kindle needs color. I love purple, and I love my Kindle. It's a match made in heaven. If you've arrived at this page you're probably the proud owner of a Kindle. Like me, you love your Kindle, but you need a cover to protect your valuable Kindle. Pick your favorite color and see what a wide range of Kindle skins and Kindle covers there are in the color of your choice. My color is purple, and I've picked out some great purple Kindle accessories for you here. Be bold with your color choice.Your Kindle will look great. PS I've now got 2 Kindles, 3 Kindle cases....I'm crazy about my Kindles. Banish the dull - add purple to your Kindle. I've had a Kindle for over a year now now, and I just love it. I bought the Kindle 3G so that I can download to it wherever I go. It's clear to read, very light, and an absolute joy, apart from one thing- the color or colour-yes, it's grey, or gray , depending on where you live. However you spell it, grey colour or gray color, it's dullsville. My laptop is pink, my wardrobe is full of purple items, and now my Kindle has joined the fun. I've given my Kindle a lovely purple cover. You can buy a purple Kindle cover, or a purple Kindle skin, for whichever version of the Kindle you own. I've selected my choices of the best purple Kindle accessories for you.Go on- go purple! News- The Kindle Fire has just been released in the UK, and I've bought the Kindle Fire HD 7inch. I now need new Kindle cases. Cover your Kindle in purple, whichever Kindle you own. Which is the best purple cover for your Kindle? There's a good choice of purple Kindle accessories. Can't decide which cover to buy for your Kindle? I had the same problem too, and I bought two covers! My first cover was a the leather Kindle cover with a reading light. I bought this with my Kindle, as it was a special offer at the time. The leather Kindle cover looks and feels lovely. It is firm to hold, and folds back to read, so that you really feel like you're reading a traditional book. I haven't used the built in light , but I can see that if you want to read in bed, or on a journey, this would be very useful. The only problem with this leather Kindle cover is that it's quite heavy. For Christmas, I put a lightweight Kindle skin on my wish list, and was given one, in purple! I love it, and will use this when I want to slip my Kindle into my purse or bag to carry around for the day. Is it a bit of an indulgence to have two Kindle covers? Heck no! Lovely purple leather covers for your Kindle. These leather covers come in purple. Luxury and colour in one. You can read more about my top choice cover for my Kindle Fire HD 7 "
The Perfect Case for the Kindle Fire HD 7"
Books with "purple" in their title. I admit that choosing a book just because it has the word "purple" in its title is not the best way to select a reading list. However, these are three very interesting books in their own right. My book group, and probably every other book group in the world, has read and enjoyed The Color Purple.Here's a very useful study guide for those who have this book on their class list. The Purple Book looks like a fascinating read, and I might download it soon. Tolstoy and the purple chair- my year of Magical Reading is a wonderful book- it's on my wish list. See where purple can take you? What a color! Now that you've covered you Kindle in purple, how about some purple reading. Here are 3 fascinating books with a purple theme. Have you read any of them yet? I'm now the proud owner of a Kindle Fire HD 7"
I now need a new purple cover for my new Kindle Fire HD 7"
I need new purple cases for my new Kindle- though I still love the original Kindle too! See how wonderful purple looks in nature. Lavender, irises, pansies, all manner of purple flowers have their place in my garden. Here is just a small selection of posters featuring purple flowers, which would look great on your walls. Will you buy a purple cover for you Kindle? To purple or not to purple, that is the question. Nope, I'm going to buy a quiet, unobtrusive cover for my Kindle. I like the idea of a purple Kindle cover- I'm seriously thinking about it. Yes, Yes Yes- a purple Kindle Cover for me please! Thanks for your vote. Enjoy your Kindle, whatever the color! How to grow and use that best of all purple plants, the lovely lavender. More purple Kindle covers on ebay. 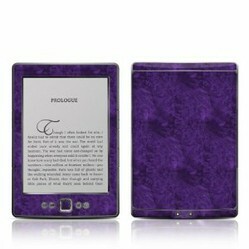 Ebay has some pretty purple Kindle skins. WhiteMoss, I love early spring's purple and yellow flowers and late fall's purple and yellow leaves! What is your favorite book that includes the word purple? I see more and more purple around us. It is becoming kind of girl power color. Can we say purple is the new black? Big Kindle fan here too. I love all the colorful cases, covers and skins that you can purchase for it. And, as my hubby has a Kindle too, it's practical to personalize each Kindle so we pick up the right one! Thanks Paul. I took your advice when buying my Kindle, and went for the 3G. I love the colour purple and I love my kindle so what a perfect combination! England's Lake District, home to William Wordsworth, is a major tourist area. There are hundreds of books and guides to the Lake District.Here are the best for your Kindle. Paisley, last fashionable in the Summer of Love, is back on trend f. Get the Paisley fashion in your life with great Paisley accessories.These make great gifts too.